1.1.1 What is a promotion programme? A promotion programme is a coherent set of operations which can include advertising campaigns in the press, on television, on radio or on the Internet; point-of-sale promotions; public relations campaigns; participation in exhibitions and fairs, and a range of other activities. It can be a B2B campaign or B2C campaign. It shall be implemented over a period of at least one year but no more than three years. raise awareness of the authenticity of European protected designations of origin, protected geographical indication and traditional specialities guaranteed. 1.1.2 Why was the promotion policy reformed in 2014? The promotion policy has been recently reformed with the adoption of Regulation (EU) No 1144/2014 which shall apply from 1 December 2015. The new promotion policy, which benefits from a more substantial budget, is intended to act as key for opening up new markets and to diversify trading partners. With the common denominator 'Enjoy, it´s from Europe', the policy aims to help the sector's professionals break into or consolidate international markets and make consumers more aware of the efforts made by European farmers. The new policy will target promotion activities with an EU added value based on a genuine strategy established at European level, bring simplification and reduce red tape. 1.1.3 What are the main changes compared to the previous system? Guidelines fixed in annex to implementing regulation and only occasionally updated. Establishment of a promotion strategy: yearly work programme of the Commission defining strategic priorities (target groups, products, themes or target markets) and adopted as an implementing act. Priority given to programmes targeting third countries. Implemented in at least two Member States or in one Member State if different from the Member State of origin of the proposing organisation(s). Exceptions for (1) Union quality schemes and (2) message which concerns proper dietary practices. Positive restrictive list in annex to implementing regulation limited to certain agricultural products listed in Annex I to the TFEU. All agricultural products of annex I to the TFEU, excluding tobacco. Certain transformed products, such as beer, chocolate, bread and pastry, pasta, salt, sweet corn and cotton. Spirit drinks with geographical indication. Fisheries products if associated to another product. Wine associated to another product or alone if subject of a multi country programme. It must be wine with designation of origin or protected geographical indication status and wine carrying an indication of the wine grape variety. in a banner displaying at least 5 brands. Producers' groups within the meaning of Art. 3 of Reg. 1151/2012 on quality schemes. Establishment of technical support to help operators participate in co-financed programmes, prepare efficient campaigns or develop activities on export markets. 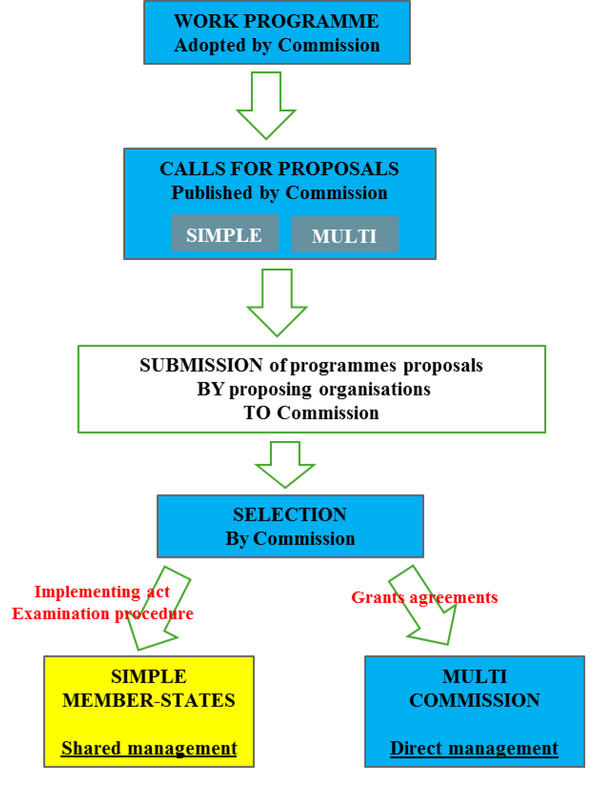 Two-step selection of programmes (member state, followed by the Commission). Programme management shared with member states. One step selection of programmes by the Commission. Multi country programmes directly managed by the Commission's agency Chafea. Simple programmes in shared management with the member states. Measures for sectors which face specific or temporary problems. EU co-financing rate of 85 % for crisis programmes. Specific arrangements in the work programme. Possible reply via measures organised on Commission's initiative. EU co-financing rate of 70 % for simple programmes. EU co-financing rate of 80 % for multi programmes and programmes targeting third countries. 5 % top on for beneficiaries from MS under financial assistance. Spending estimated to 200 M€ per year as from 2019. 1.1.4 The rules concerning the promotion aid scheme are in 4 different legislative texts, where could I find a more user-friendly compilation of the rules? There are indeed several legislative acts (basic act, delegated act, implementing act and annual work programme), which is the normal legislative structure. The applicable rules are summarised with some illustrations in a presentation available online. 1.1.5 What is a "simple" promotion programme and what is a "multi" promotion programme? A simple programme is a promotion programme submitted by one or more proposing organisations from the same Member State. A multi programme is a programme submitted by at least two proposing organisations from at least two Member States or one or more European organisations. 1.1.6 What should be the size of a promotion programme in terms of budget? There is no budgetary requirement for a promotion programme. 1.1.7 Can you give examples of successful promotion programmes co-financed by the EU? Some examples of past promotion programmes are available here. 1.2.2 What are the eligible products and schemes? The products listed in Annex I to the Treaty on the Functioning of the European Union (TFEU), excluding tobacco. The following processed products: beer, chocolate and derived products, bread, pastry, cakes, confectionery, biscuits and other baker’s wares, beverages made from plant extracts, pasta, salt, natural gums and resins, mustard paste, sweetcorn, cotton. The spirit drinks with a protected geographical indication. The fisheries products if associated to one or several products. In Annex I of the Treaty on the Functioning of the European Union (TFEU), the products are listed with further reference to the Combined Nomenclature (CN). You should therefore first identify the CN code of the product you wish to promote and then check if that CN code is listed in Annex I to the TFEU. The combined nomenclature and its explanatory notes can also be useful to assess the eligibility of your product(s). A programme covering a scheme may be illustrated by one or several products. In the internal market, these products shall appear in secondary message in relation to the main Union message. Wine with designation of origin or protected geographical indication status or wine carrying an indication of the wine grape variety is indeed eligible. Note that, in the case of simple programmes, wine must be associated with other products (wine and cheese for instance). Promotion campaigns on wine (the same applies to spirit drinks and beer) targeting the internal market shall be limited to informing consumers of the quality schemes or of the responsible consumption of these beverages. 1.2.4 What should be the content of a programme on wine, beer or spirit in the internal market? In the internal market, with regard to spirits, wine and beer, a promotion shall be limited to (i) informing consumers of the EU quality scheme in its main message (illustrated by one or several products) or (ii) informing consumers of the responsible consumption of those beverages, or (iii) both. Tastings and distribution of samples are not allowed in the context of campaigns on responsible drinking implemented in the internal market; these activities are however acceptable if ancillary to and supportive of the provision of information measures on the quality schemes and organic production method. 1.2.5 Are the fishery and aquaculture products eligible? Yes, fishery and aquaculture products are eligible if they are listed in Annex I to Regulation (EU) No 1379/2013 and associated with other products. 1.2.6 Which proposing organisations are eligible? Trade or inter-trade organisations, established in a Member State or at Union level, and representative of the sector(s) concerned in that Member State or at Union level, and groups of producers and processors active in geographical indications. A trade or inter-trade organisation shall be deemed to be representative (i) where it accounts for at least 50% as a proportion of the number of producers, or 50 % of the volume or value of marketable production of the product(s) or sector concerned, in the Member State concerned or at Union level; but lower percentages may be accepted if justified or (ii) where it is an interbranch organisation recognised by the Member State. Producer organisations or associations of producer organisations that have been recognised by a Member State. Agri-food bodies involved in a mission of public interest in charge of promotion. Those bodies must have been legally established in the Member State in question at least two years prior to the date of the call for proposals. They shall be representative of the product/sector by means of having representatives of product/sector among its memberships (with the exception of programmes carried out after a loss of consumer confidence). Only applications from entities established in EU Member States are eligible. The proposing organisation shall have the necessary technical, financial and professional resources to carry out the programme effectively. In order to boost competition and ensure the widest access possible to EU funding, a proposing organisation shall not receive support for information for the same campaign more than two consecutive occasions. This means that a campaign can last for a maximum of six years. 1.2.7 How can I find data on representativeness of a proposing organisation to demonstrate the 50% threshold? What if I cannot demonstrate it? Trade organisations generally have data on the market. It is generally one of their objectives: improving knowledge and the transparency of production and the market of a sector, including by publication of aggregated statistical data on production costs, prices, etc. There is no need to ask any national authority to certify these data. In an application for EU funding, these data shall be easy accessible (extract of studies or link with webpages, etc.). In addition, according to Article 2 of the Delegated Regulation (EU) No 1829/2015, lower thresholds of representativeness can be accepted in duly justified cases, such as a specific structure of the market. 1.2.8 I am a trade organisation of producers of hop. Can I submit a proposal for a campaign on beer, even though I do not represent the final product? According to the Regulation (EU) No 1144/2014, a trade organisation can submit a proposal provided that it is representative of the sector or the product concerned by the programme. If the promotion programme concerns beer, it is up to the trade organisations of that sector to submit a proposal. The conditions of representativeness are detailed in Article 1 of the Delegated Regulation (EU) No 1829/2015. The criterion of 50 % of the number of producers or 50 % of volume or value of marketable production applies to the product(s) or sector concerned by the programme. If a proposing organisation, which may be a consortium of several professional organisations, does not fulfil that condition, it could still provide a proof of representativeness, pursuant to the derogation provided for in paragraph 2 of this Article. 1.2.9 Trade organisations of my country are organised on a regionalised basis, so that I do not reach the threshold. Can I benefit from the derogation on representativeness? Yes, in that case, the proposing organisation will need to explain that because of the administrative organisation of its country, there are only "regional" trade organisations and that it cannot reach the 50% threshold. It shall belong to the proposing trade organisation to demonstrate that it can still be considered as representative of the product or sector concerned, due to i.e. its share in the region concerned, at Member State level, exports, etc. 1.2.10 What does "having the necessary technical, financial and professional resources to carry out the programme effectively" mean? Shall the beneficiary have the funds equivalent to the overall costs of the programme in its bank account? The operational and financial capacity of an organisation will be assessed on a case-by-case basis taking into account the nature of the programme to be implemented. The relevant selection criteria are listed in detail in Section 8 of the call for proposals. Organisations can check their financial viability using the financial self-check tool available on the Participant Portal. 1.2.11 I am a private company, am I eligible for EU funding for promotion programmes? In general no, as only the proposing organisations listed under 1.2.6 can be eligible. The promotion policy is not aimed to finance the advertising of a private business company. It is designed to have generic campaigns on products or schemes benefiting to a whole sector. Nevertheless, in certain cases, it is not excluded that some of the eligible proposing organisations may be registered as private companies. This could be for example the case of a private company that would be considered as a group under Regulation (EU) No 1151/2012 thus eligible proposing organisation in accordance with Article 7(1) of Regulation (EU) No 1144/2014. 1.2.12 I am a newcomer to the system, can I apply? Yes, provided that you respect the conditions of eligibility. Promotion campaigns co-financed by the Union should aim at opening new markets and should be undertaken by a wider range of organisations. In case of "Agri-food bodies involved in a mission of public interest in charge of promotion", they must have been legally established in the Member State in question at least two years prior to the date of the call for proposals. 1.2.13 What are the main eligibility criteria of a promotion programme? The eligibility criteria are defined in the annual work programme and in the call for proposals. Simple and multi programmes need to have a Union dimension, both in terms of content of the message and impact, in particular to provide information on European production standards, the quality and safety of European food products and European dietary practices and culture, promote the image of European products on the internal market and international markets, raise awareness of European products and logos among the general public and in commercial undertakings. This means in particular for a programme in the internal market covering one or more schemes (PDO-PGI-TSG, organic, Rup) to focus on the(se) scheme(s) in its main Union message, one or several products illustrated by one or several products in secondary message. Besides, the simple programmes shall be of a significant scale, notably in terms of its foreseen measurable cross-border impact. In the internal market, this means that a programme shall be implemented in at least two Member States with a coherent share of the allocated budget, or be implemented in one Member State if that Member State is different from the Member State of origin of the proposing organisation(s). This requirement does not apply to programmes relaying a message which concerns the Union quality schemes and to programmes relaying a message which concerns proper dietary practices. 1.2.14 Can a programme convey a health message? Yes, but this message shall, in the internal market, comply with the Annex to Regulation (EC) No 1924/2006, or be accepted by the national authority responsible for public health in the Member State where the operations are carried out. In third countries, it shall be accepted by the national authority responsible for public health in the country where the operations are carried out. 1.2.15 Our organisation is currently implementing co-financed programmes on information provision and promotion measures. Can we present a new distinct project to be implemented in the same target markets as our on-going programmes? It is possible to apply for a grant for a programme which is different from the one already financed from the Union budget, even if such a programme targets the same market. If the applicant plans to implement programmes in parallel and some of the activities are common to both programmes, the relevant costs shall be declared only once. 1.2.16 How can an agri-food body demonstrate its eligibility? It is an agri-food sector body. Its objective is to provide information on, and to promote, agricultural products. It has been entrusted, by the Member State concerned, with a clearly defined public service mission in this area. It has been legally established in the Member State in question at least two years prior to the date of the call for proposals. In addition, in order to be considered representative, the agri-food sector body must have representatives of the product(s) or sector concerned by the programme among its memberships. The condition on membership can be fulfilled via mandatory financial contributions of representatives of the product(s) or sector concerned. 1.2.17 Can my organisation be recognised at a regional level? A producer organisation or an association of producer organisations as referred to in Article 7(1)(c) of Regulation (EU) No 1144/2014 shall be deemed to be representative of the product(s) or sector concerned by the programme where it is recognised by the Member State in accordance with Articles 154 or 156 of Regulation (EU) No 1308/2013 or with Article 14 of Regulation (EU) No 1379/2013. If in a particular Member State such recognition is established at the regional level, the criterion of representativeness will be considered as fulfilled. 1.2.18 Are British applicants eligible? Eligibility criteria must be complied with for the entire duration of the grant. If the United Kingdom withdraws from the EU during the grant period without concluding an agreement with the EU ensuring in particular that British applicants continue to be eligible, British applicants will cease to receive EU funding (while continuing, where possible, to participate) or be required to leave the project on the basis of Article 34.3 of the grant agreement. 1.2.19 Can a programme in the internal market target the UK? Yes. However, applicants shall bear in mind that withdrawal of the UK from the EU may lead to changes in the implementation of the programmes. 1.2.1 Can Chafea helpdesk confirm that my organisation is eligible? Chafea cannot validate the eligibility of potential proposing organisations prior to submission of the proposal. Potential applicants must proceed to a careful examination of all the conditions in order to establish whether their statute and the type of actions they have in mind are in conformity with the legal rules. It is indeed up to the interested parties to make sure that they comply with the regulations in force. 1.3.1 What are the co-financing rates? The EU co-financing rate is 70% for simple programmes, 80% for multi programmes and programmes targeting third countries, 85% for programmes in case of serious market disturbance. There is also a 5 percentage point top-up for beneficiaries from MS under financial assistance. The rest is financed exclusively by the proposing organisation. A proposing organisation cannot receive additional co-financing from the Member State for the promotion programme at stake. 1.3.2 What are the costs eligible for Union funding? indirect eligible costs shall be determined by applying a flat rate of 4 % of the total direct eligible personnel costs of the proposing organisation. 1.3.3 What is considered as double-funding? A proposing organisation who already receives Union financing for the same information provision and promotion measures shall not be eligible for Union financing for those measures under the promotion Regulation (EU) No 1144/2014. 1.3.4 Can we apply for a grant which is lower than the theoretical maximum EU contribution? It is indeed possible to apply for a grant amount which is lower than the theoretical amount calculated by applying the EU co-financing rate to the estimated total costs. It is up to the applicant to determine the amount of EU co-financing requested in its application. The reimbursement rate is fixed (70-80%) and applied to the eligible costs submitted by the applicant up to the maximum grant amount. 1.3.5 Can the national or local government contribute to the own financing? Financial contributions of national or local governments are not allowed in the context of the calls for proposals for promotion of agricultural products. 1.3.6 Can the members of my organisation cover the own financing? Financial contributions given to a beneficiary by the members of the proposing organisation, specifically to be used for costs that are eligible under the programme, are allowed and will be considered as receipts. 1.3.7 Are costs of samples eligible? Yes, if reasonable and duly justified, the costs of samples will be considered as eligible. The guide for applicants provides more details on how to present those costs. 1.4.1 Who can implement the programme? For simple programmes, there is a legal requirement to implement the programme with the support of an implementing body. The proposing organisation shall choose the bodies that will implement the programme with a view, in particular, to ensuring that measures are implemented effectively. Nevertheless, a proposing organisation may implement certain parts of a programme itself, if the proposing organisation has at least three years’ experience in implementing information provision and promotion measures; and if the proposing organisation ensures that the cost of the measure which it plans to carry out itself is not in excess of the normal market rates. 1.4.2 How is the implementing body selected? Proposing organisations must select bodies responsible for implementing the programmes through the appropriate competitive procedure ensuring best value for money. In doing so, they must avoid any situation where the impartial and objective implementation of the programme is compromised for reasons involving economic interest, political or national affinity, family or emotional ties or any other shared interest (‘conflict of interests’). Where the proposing organisation is a body governed by public law within the meaning of Directive 2014/24/EU, it must select bodies responsible for implementing simple programmes in accordance with the national legislation transposing this Directive. 1.4.3 If I have already a framework contract with an implementing body: could I keep this one? Yes if the conditions set out above are respected. In other words, the existing framework contracts must have complied with best value-for-money and absence of conflict of interests at the time of their award. 1.4.4 Can the implementation of a programme be entrusted to a company that has been established, owned or financed by the proposing organisation? In such cases, the obligation to avoid a conflict of interests in the selection of an implementing body could not be respected. However, in case of entities that have a structural link with the beneficiary, in particular legal or capital link, it is foreseen that beneficiaries may entrust part of the implementation of the programme to such entities however only on a non-profit basis i.e. the contract would be limited to the costs incurred by the entity, without a profit margin. In the programme proposal, these entities will need to be identified together with the tasks entrusted and the corresponding estimation of the costs. 1.4.5 When should the actions start? The starting date of the implementation of the programme shall be the first day of the month following the date of entry into force of the contract/agreement; it may be postponed to up to 6 months after the date of entry into force of the agreement if it is so foreseen and justified in the description of the action, in particular due to seasonality of the product concerned by the programme or participation in a specific fair or event. Financial support may apply only to costs pertaining to the implementation of the programme that have arisen after the date of signature of the grant agreement. Exceptionally, a grant for a multi programme may be awarded for an action which has already begun only where the applicant can demonstrate in its proposal the need to start the action before the grant agreement is signed. For example, a typical case would be a situation where the applicant needs to book a space at a trade fair and pay a deposit to the fair organisers several months in advance. In such cases, costs eligible for financing may not have been incurred prior to the date of submission of the grant application. This possibility is however not foreseen for simple programmes due to a different management mode and legal basis. 1.4.6 When should I select the implementing body? In case of simple progammes, grant agreements are concluded within three months following the adoption of the EC decision announcing accepted and rejected proposals. Before the signature of the grant agreement, the Member State will validate the procedure for selection of the implementing body. In case of multi programmes which are managed by Chafea, the grant signature process also takes up to three months. The programme can start even if the implementing body is not yet selected. In both cases, the applicants may wish to carry out the selection procedure prior to receiving feedback on the outcome of evaluation of their proposal, and include an appropriate suspension clause in their tender documents/contract with the implementing body. 1.5.1 What is meant by the "main Union message" of a promotion programme? The Union promotion scheme should supplement promotion schemes run by Member States or private sectors and should focus on a Union message. The main message thus needs to make reference to Europe in general, to the EU, to the CAP, EU legislation, EU products or EU production standards. In case of European quality schemes, the main Union message shall focus on the scheme itself. On this website you can find examples of "Union messages" by browsing past or on-going co-financed campaigns. The Union message is linked to the Union dimension which is assessed both in terms of content of the message and impact. To present the Union dimension, the applicants shall clearly describe how the proposed programme will disseminate information on and promote one or several specific features of EU agricultural production methods and products, such as European dietary practices and culture, food safety, traceability, authenticity, labelling, nutritional and health aspects, animal welfare, respect for the environment and sustainability, and the characteristics of EU agricultural and food products, particularly in terms of their quality, taste, diversity or traditions. 1.5.2 Why and how should the signature "Enjoy, it's from Europe" be used? The signature "Enjoy, it's from Europe" is the common signature of all EU co-financed programmes. It shall be displayed on each campaign material. Note that the signature is not intended to be used as the main message of the campaign. Instructions on the use of the signature are available here. Moreover, the Campaign visual creator can help you in creation of visual material in line with the applicable rules. 1.6.1 How can origin be mentioned in promotion material? • In the internal market, the mention of the origin must always be secondary in relation to the main Union message of the campaign. • In third countries, the mention of the origin may be on the same level as the main Union message of the campaign. • For products recognised under the quality schemes referred to in point (a) of Article 5(4), the origin registered in the denomination may be mentioned without any restriction. The main message of the programme shall be a Union message and shall not focus on a specific origin. The main Union message of the programme shall not be obscured by material related to the origin of the product, such as pictures, colours, symbols or music. The mention of origin on information and promotional material shall be limited to the national origin, namely the name of the Member State, or to a common supra-national and pan-European origin (such as Mediterranean, Alpine, Nordic, Baltic, etc.). The mention of origin may be explicit (name of the country) or implicit (flag, logo). Any mention of origin shall not amount to a restriction of the free movement of agricultural and food products, it shall complement the main Union message. The mention of origin shall appear in a separate area from that devoted to the main Union message. The mention of origin on information and promotional material shall be limited to visual material. Mention of the origin shall only be made in written material. Therefore, it is impossible to have a "main" and "secondary" message in – for example - a radio spot or voice over of a video. 1.6.2 Can a national organic logo be displayed alongside the EU organic logo? If it is a campaign on the internal market the national logo could only be mentioned in a manner secondary in relation to the main Union message, i.e. the EU organic logo, of the campaign. If it is a campaign in third countries, the national logo could be mentioned at the same level as the main Union message of the campaign. 1.6.3 Why is the mention of the regional origin not allowed? The mention of origin on information and promotional material shall indeed be limited to the national origin, namely the name of the Member State, or to a common supra-national origin. Allowing the mention of origin should not undermine the EU policy of quality schemes (PDO, PGI, STG, RUP). If the mention of a local origin was allowed for a product which does not have an EU quality logo, it would create confusion with all the EU quality policy: generic English Lamb Vs. specific Welsh Lamb PGI for instance. The whole policy on quality logos would then be weakened. To limit this problem, only the national origin can be mentioned. Nevertheless, a regional origin can be mentioned if it is in the logo of a national quality scheme, provided that it respects the rules on origin defined in the Regulation (EU) No 1144/2014 (in a secondary message compared to the main Union message of the campaign, at the same level as the main Union message). 1.6.4 What is eligible as pan-European origin? The mention of origin on information and promotional material can indeed also refer to a common supra-national origin (such as Mediterranean, Alpine, Nordic, Baltic, etc). It shall correspond to a large pan-European geographical area which comprises several Member States. Nevertheless, smaller cross border regions (Limburg, Flanders, Thrace, etc.) are not eligible, in the sense that they do not constitute a sufficiently wide pan-European reference; and their mention could also create confusion with the names of regional EU quality schemes. 1.7.1 How can brands be mentioned? Information provision and promotion measures shall not be brand-oriented. Nevertheless, it shall be possible for commercial brands of promoted products of the proposing organisations to be visible during demonstrations or tastings and on the printed information and promotional material displayed or distributed during demonstrations and tastings, provided that the principle of non-discrimination is respected and that the overall, non-brand-oriented nature of the measures remains unchanged. The principle of non-discrimination shall ensure equal treatment and access for all brands of the proposing organisation. It means that the proposing organisation shall keep evidence that all members of the proposing organisation concerned have been given an equal opportunity to display their brands. Each brand shall be equally visible and its graphic presentation shall use a separate and smaller format than the main Union message of the campaign. A minimum of 5 brands shall be displayed, except in duly justified circumstances pertaining to the specific situation of the Member States concerned. individually, in separate and identical booths in a neutral and identical way, on the front of the counter of the booth or equivalent support for each brand. In that case, the display of the brand name shall not exceed 5% of the total surface area of the front of the counter of the booth or equivalent support. On the printed material distributed during demonstrations or tastings, brands may only be displayed together in a banner at the bottom of the page which shall not exceed 5% of the total surface area of that page. 1.7.2 The rules on brands are quite strict: Why imposing a minimum of 5 brands together and not less? Why only 5 % of the surface dedicated to brands? A minimum of five brands shall be displayed, so that the promotion campaign remains a generic campaign and not an advertising campaign for a limited number of private companies. It is nevertheless possible to display less than five brands if there are fewer brands in the Member State of origin of the proposing organisation for the product or scheme subject of the programme; and if it has not been possible to organize a multi–product or multi-country programme permitting more brands to be displayed. Similarly, in order to guarantee that the display of brands will not weaken or divert the main European message, it is important to fix a maximum percentage of 5 % for the surface of communication dedicated to brands. These requirements guarantee the fundamental principle of the Regulation (EU) No 1144/2014 stating that promotion programmes should not be brand-oriented. 1.8. What is the technical support? 1.8.1 What is the technical support? improving knowledge of Union rules concerning programme development and implementation, mainly by providing adequate information online, organising or participating in events and fostering the development of a network of agro-food operators with the aim of helping operators to take part in co- financed programmes, to conduct effective campaigns or to develop their export activities. 2.1.1 How can I apply? The application should be done online via the dedicated portal. The potential beneficiary should register and get a Participant Identification Code (PIC). A guide for applicants will be provided for each call for proposals with all practical details. To get more familiar with the portal and those rules, it is advised to check the existing guidance documents. 2.1.2 Is it possible to submit a programme electronically? The programme proposal can only be submitted electronically. The application form is composed of several parts. The first part is the standardized part that includes administrative information. The proposing organisation will need to fill-in predetermined check boxes, drop down lists, etc. The second part is the technical annex. This is a pdf document in which the proposing organisation will describe, following a standard template with specific sections, the objectives, the Union dimension, the actions foreseen, the budget, etc. Other annexes to be uploaded include information on the legal and financial status of the applicants, as well as on their representativeness. 2.1.3 In which language can a programme be submitted? For multi programmes: applicants are encouraged to submit their proposal in English to facilitate processing of the application including its review by independent experts who provide technical input to the evaluation. In addition, applicants should be aware that Chafea will, in principle, use English to communicate with beneficiaries regarding the follow up and the monitoring of the co-financed programmes (grant management stage). In addition, if the technical part of the application is written in another EU official language than English, it should also include an English translation in order to facilitate assessment by the evaluators. 1 This information is available here. 2.1.4 Can I contact my national Ministry for advice and information? Yes. Member States are not involved in the selection procedure, but they are in charge of the management of simple promotion programmes. Thanks to their expertise, they may have a role of adviser in the conception of the programme for the proposing organisation (for both simple and multi programmes) or share best practices from previous programmes. Their contact details are available in the list of competent national authorities. 2.1.5 My proposing organisation has a weak financial capacity. Can the financial capacity be proven by our members? Financial standing of entities which do not have the legal status of (co)applicants may not serve as an element to assess the financial capacity of applicants. Nevertheless, a weak financial capacity of an applicant should not prevent it from submitting a proposal. All applicants are invited to run a financial viability self-check and to address the results of this check in section 8 of the technical proposal. In particular, if the result of such self-check is "weak", they shall explain how the liquidity will be provided (in addition to pre-financing). 2.1.6 Shall we appoint and have a validated LEAR (Legal Entity appointed representative) before the submission of our application? The appointment of a LEAR is not necessary at the submission stage. In order to complete the registration process, applicants only need to provide the information requested in sections "Organisation data", "Legal address" and "Contact information". The LEAR will be validated only for multi programmes which are selected for co-financing. 2.2.1 How are simple programmes and multi programmes selected? The Commission evaluates and selects simple and multi programme proposals received in response to the call for proposals. 2.2.2 What are the main award criteria? The award criteria are defined in the annual work programme and in the call for proposals. To be assessed against the award criteria, the proposals shall meet the eligibility, exclusion and selection (e.g. stable and sufficient sources of funding) criteria. Three independent experts will examine each proposal following award criteria defined in the annual work programme. a) Relevance of proposed information and promotion measures to the general and specific objectives listed in Article 2 of Regulation (EU) No 1144/2014, aims listed in Article 3 of that Regulation, as well as to priorities, objectives and expected results announced under the relevant thematic priority. b) Union message of the campaign. c) Impact of project at Union level. a) Quality and relevance of the market analysis. b) Coherence of the programme strategy, objectives, and key messages. c) Suitable choice of activities with respect to objectives and programme strategy, adequate communication mix, synergy between the activities. d) Concise description of activities and deliverables. e) Quality of the proposed evaluation methods and indicators. a) Project organisation and management structure. b) Quality control mechanisms and risk management. a) Justification of the overall level of investment. b) Suitable allocation of budget in relation to the objectives and scope of the activities. c) Clear description of the estimated costs and accuracy of the budget. d) Consistency between the estimated costs and deliverables. e) Realistic estimation of costs of project coordination and of activities implemented by the proposing organisation, including number and rate of person/days. A separate ranked list shall be established for each priority topic listed in the annual work programme. 2.3.1 How are simple programmes and multi programmes managed? Simple programmes are managed under shared management with the Member States. Multi programmes are managed under direct management by the Commission's executive agency Chafea. A one-stop shop at Chafea facilitates management of multi programmes which are implemented by beneficiaries located in several countries. 2.3.2 What is the role of Chafea? The Consumers, Health, Agriculture and Food Executive Agency is an executive agency of the European Commission. It is based in Luxembourg. It is entrusted by the European Commission with the management of some of the phases of the programme implementation, including publication of calls for proposals, reception and evaluation of proposals, preparation and signature of grant agreements for multi programmes and monitoring of their implementation. 2.3.3 Why do the implementing and delegated acts mainly refer to simple programme and not multi programmes? Simple programmes are implemented in shared management with the Member States, in accordance with the rules established in the basic act, delegated and implementing acts, and the horizontal financial rules established in Regulation (EU) No 1306/2013 of the European Parliament and of the Council. Multi programmes are managed under direct management rules in accordance with the Financial Regulation (EU, Euratom) No 1046/2018 of the European Parliament and of the Council. Therefore, for multi programmes, it is the Financial Regulation which applies. As the same proposing organisation could have both simple and multi programmes, the implementation rules for both programmes should differ as little as possible. To that end, simple programmes are subject to rules that are equivalent to the provisions of the Financial Regulation concerning grants which apply to multi-programmes. 2.3.4 When should the contracts be signed? For simple programmes, Member States shall conclude contracts for the implementation of programmes with the selected proposing organisations within 90 calendar days of the notification of the Commission act selecting programmes (provided that the implementing bodies have been selected correctly). Beyond that deadline, no contracts may be concluded without prior authorisation from the Commission. The same deadline applies for multi programmes: for signing grant agreements with proposing organisations, a maximum of three month deadline applies from the date of informing proposing organisations that they have been successful. 2.3.5 Can we delay the start of implementation of the programme? The starting date of the implementation of the programme shall normally be the first day of the month following the date of signature of the contract. However, the starting date may be postponed for up to 6 months, in particular to take into account the seasonality of the product concerned by the programme or participation in a specific event or fair. This should be justified in the programme proposal. 2.3.6 What is the rhythm of payments? The proposing organisations will submit a payment request to the Member State for simple programmes and to Chafea in case of multi programmes. For simple programmes, within 30 days from the date of contract signature, the proposing organisation may submit an application for an advance payment of up to 20% of the maximum Union financial contribution, together with a security. For multi programmes, no application for an advance payment would be needed; the security for the advance payment is required only when it is considered necessary to limit financial risks connected with this payment. For both simple and multi programmes, requests for an interim payment shall be normally submitted by the proposing organisation within 60 days from the date on which the implementation of a year of the programme has been completed. Such requests shall cover the eligible costs incurred during the year concerned and shall be accompanied by an interim report comprising a periodic financial report and a periodic technical report. Requests for payment of the balance shall be submitted by the proposing organisation within 90 days of the completion of the programme. The request shall be accompanied by the interim report for the last reporting period and the final financial and technical reports. 2.3.7 Who is in charge of the controls and when? The controls of the implementation of the programmes will be made by the Member States for simple programmes, and by Chafea or the Commission for multi programmes. For simple programmes, administrative checks will be done for each payment request. In addition, there will be on-the-spot checks (technical and accounting checks) at the premises of the proposing organisation and, if appropriate, of the implementing body. There will be at least one on-the-spot check during its implementation between the first interim payment and the payment of the balance. The procedure to select the implementing bodies will be checked by the Member States before the signature of the contract. For multi programmes, Chafea checks the proper implementation of the programme and compliance with the obligations under the grant agreement, including assessment of deliverables and reports. 2.3.8 Should eligible VAT be included in the estimated budget of the proposed programme? Value added tax (‘VAT’), if not recoverable under the applicable national VAT legislation and paid by a beneficiary other than a non-taxable person, is considered as eligible cost (cf. Commission Delegated Regulation (EU) 2015/1829). Therefore the costs that are estimated in the budget for the proposed programme should include the non-deductible VAT which the beneficiary will have to bear. The 'opposite' is also true: if a beneficiary can recover the VAT, the latter is not eligible thus should not be included in the estimated budget. 2.3.9 What if a programme is proposed by proposing organisations which have a different VAT status? A proposal for a campaign that is proposed by several proposing organisations should include the estimate budget that shows the costs of each beneficiary participating in the programme. The application for payments should be accompanied by interim reports which inter alia include individual financial statement for each beneficiary detailing the eligible costs for the period concerned (cf. Commission Implementing Regulation (EU) 2015/1831). Therefore a beneficiary that cannot recover the VAT should include it in the declared costs; on the contrary, recoverable VAT is not eligible thus the beneficiary should not include it when declaring costs. 2.3.10 How is the impact of the programmes assessed? In order to assess the effectiveness and efficiency of information and promotion programmes, performances indicators for the evaluation of the programmes shall be established in the programme proposal. These performance indicators include output indicators (such as number of events organised, number of spots aired on TV/radio or published print), result indicators (such as number of professionals/experts/importers/consumers who participated in events who were reached by a TV/radio spot/print or online add, number of visitors on the website or likes on their Facebook-site) and impact indicators (such as sales trends of the sector, value and volume of Union exports of the product promoted; change in the Union products market share; change in the level of recognition of the logos of the Union quality schemes). A final study evaluating the results of the promotion programme shall be undertaken by an independent external body, using the indicators set in the programme. 2.3.11 What is the role of a coordinator? When a programme involves more than one beneficiary, the participating beneficiaries shall nominate among them a coordinator i.e. the beneficiary that will be the central contact point for the Member State or Agency. ensure that the payments are made to the other beneficiaries without unjustified delay. The core tasks of the programme (i.e. its technical and financial coordination and the management of the strategy) can neither be subcontracted nor delegated to any other co-beneficiary. The Grant Agreement includes provisions on the roles and responsibilities of the coordinator and other participating beneficiaries. The Grant Agreement also requires that participating beneficiaries conclude ‘consortium agreement’ i.e. internal arrangements with regard to operation and coordination between participants in order to ensure proper implementation of the programme. 2.3.12 What is a consortium agreement? Can you provide a template? When several beneficiaries/applicants are involved in the programme, a consortium agreement shall complement the grant agreement. The consortium agreement can take various forms, but a standard written agreement is the most common one. The agreement shall not contain provisions that are contrary to the grant agreement. There is no specific template to be used but for guidance on consortium agreements, applicants may consult the Online Manual and the Guidance "How to draw up your consortium agreement". The consortium agreement does not have to be submitted with the proposal, but has to be available by the time of signature of the grant agreement. 2.3.13 During implementation of a co-financed programme, could activities and the related budget be modified, for instance to transfer the savings from one year to the other? Do we need to sign a contract amendment? The estimated budget breakdown indicated in the programme proposal (Annex 2 to the Grant Agreement (GA)) may be adjusted during the implementation — without an amendment — by transfers of amounts between budget categories and between beneficiaries in case of multi beneficiary programme, if the programme is implemented as described in the programme (Annex 1 to the GA). Beneficiaries may not add costs relating to subcontracts that are not provided for in Annex 1, unless such additional subcontracts are approved by an amendment. It is however possible that Chafea/Member State approves the subcontracts not set out in Annex 1 and 2 without an amendment if they are specifically justified in the (periodic) technical report and they do not entail changes that counter Article 39 of the GA (see also Article 10.1 of the GA). If the budget transfer is due to a significant change in Annex 1, an amendment to the GA is needed. If the incurred eligible costs are lower than the estimated eligible costs, the difference can be allocated to another beneficiary or another budget category, provided that this does not represent a breach of Art 39 of the GA. The amount reimbursed for the other beneficiary (by application of its reimbursement rate) or for the other budget category (to which the budget transfer is intended) may thus be higher than planned. 2.3.14 Can I change the products of my programmes (adding new products or replacing them) during the implementation? No. Changing the promoted products would represent a significant change that affects the programme as foreseen in Annex 1 to the grant agreement, and would therefore require an amendment. However, article 39 of the grant agreement specifies that amendments may not result in changes that — if known before awarding the grant — would have had an impact on the award decision or would breach the principle of equal treatment of applicants. Changing the products concerned by the proposals may have had an impact on the award decision and can therefore not be accepted during implementation of a programme. The beneficiaries have to implement the programme as described in Annex 1 (see Article 7 of the grant agreement). 2.3.15 What kind of changes can be done through an amendment? The decision of awarding a grant, i.e. selection of the proposals for Union's financial contribution, is based on the evaluation of the programme proposals that contain the description of the activities and the predicted results. The undertakings contained in the approved programme are an integral part of the GA and binding on the beneficiary, therefore an amendment should not have an effect of jeopardising or reducing them. The beneficiaries have to implement the programme as described in Annex 1 (Article 7 of the Grant Agreement (GA)). Serious breach of obligations under the GA, including improper implementation of the programme may lead to a reduction of the grant (Article 27 of the GA), suspension of payments (Article 32 of the GA), suspension of the programme implementation (Article 33 of the GA) or termination of the Agreement (Article 34 of the GA). - do not comply with the rules applicable to the GA or with provisions of the GA itself. According to Article 39 of the GA, a request for an amendment needs to be justified. The decision on the amendments is at the discretion of the Agency (Chafea) for multi and of the Member State competent authorities for simple programmes. 3.1.1 What is the goal of the annual work programme? The annual work programme is a tool aiming at providing a framework for a dynamic and targeted promotion policy, aligned with the needs of the sector. The objective of the annual work programme is to define strategic priorities for the promotion policy in terms of populations, products, schemes or markets to be targeted and the nature of the information and promotion messages to be imparted. The establishment of strategic priorities for the promotion policy was a recommendation of the European Court of auditors, in order to avoid a dispersion of resources and to increase Europe’s visibility through the information provision and promotion measures. 3.2.1 How will the annual work programme be implemented and when? The annual work programme will be implemented through the publication of the calls for proposals for simple and multi programmes in early 2019 with the aim to select promotion campaigns for funding. The timetable will be detailed in the call. The figure below gives an indicative calendar for the selection procedure. 3.2.2 Is the 3 month deadline not too short to prepare and submit a proposal? The launch of the call is a technical starting point from which applications can be submitted. The priorities to be targeted are known well in advance to the call; the annual work programme was adopted in November 2018 and discussed with Member States and stakeholders in full transparency as from May 2018. Workshops and info days have been organised in almost all Member States to inform potential beneficiaries of the opportunities offered by the promotion policy. 3.5.1 How to present the budget of the proposal? How can we present the fees of implementing bodies in the budgetary table? All costs relating to implementation of tasks by the implementing bodies should be presented in the column "Direct costs of subcontracting". Implementing body fees can be included in the cost of each activity or shown separately. 3.5.2 How can we present the personnel costs of the staff coordinating the project? The cost of staff coordinating the project shall be included in section 1 -"Project coordination" of the detailed budgetary table. Such costs include, inter alia, coordination with the implementing body and the Member State/Chafea managing the contract, as well as all coordination tasks listed in Article 25.2 of the Model grant agreement in case of multi beneficiary grants. 3.5.3 Where can we include the overall accounting costs? Accounting fees should be covered by indirect costs. 3.3.1 How did the Commission define the priorities for the Annual Work Programme (AWP) of 2019? Market priorities have been defined on the basis of the objectives of Regulation (EU) No 1144/2014 which is to increase the number of activities aimed at third countries where there is the highest potential of growth and, in the internal market, inform consumers about the high standards of EU products and the EU quality schemes. The Commission consulted the Member States and also received many contributions from stakeholders, through the Civil Dialogue Group on Quality and Promotion. For third countries, it conducted a macro-economic analysis on projected increase in imports, peered with imports' growth potential, as well as a policy evaluation on Free Trade Agreements and expected removal of sanitary and phyto-sanitary barriers. The Commission also took into consideration the difficult situation of beef/veal, rice, table olives and fruit and vegetables' sectors. With a total of 191.6 M€ available for promotion programmes in 2019, the EU will help the sectors' professionals to finance information and promotion campaigns to gain new markets in an increasingly competitive world. 3.3.2 What are the priorities in 2019? 3.3.3 Why is the emphasis put on external markets? Over the period 2001-2011, only 30 % of the budget earmarked for information provision and promotion measures was spent on measures targeting third country markets, even though those markets offer major growth potential. Arrangements are therefore needed in order to encourage a larger number of information provision and promotion measures for Union agricultural products in third countries, focusing not only on the capitals of these countries but also on other cities. This is why the annual work programme allocates a majority of the budget to information and promotion programmes in third countries. 3.3.4 In the internal market, why is the emphasis put on GIs and organic? Information and promotion programmes targeting Union quality schemes should be a key priority in the internal market: they will improve the visibility and understanding of EU policy. Such schemes provide consumers with assurance on the quality and characteristics of the product or the production process used, and enhance their market opportunities. One of the expected results is to increase the levels of recognition of the logo associated with the Union quality schemes by the European consumers. According to special Eurobarometer (No 473), only 18% of European consumers recognize the logos of products that benefit from a protected designation of origin (PDO) and a protected geographical indication (PGI), and 15% for the Traditional Specialty Guaranteed, these being the main Union quality schemes. Although awareness of the organic farming logo has increased four points since 2015, still only 27% of European consumers recognize the EU logo of organic farming. There is a particular interest in helping producers to consolidate or develop new markets in certain sectors. European breeders of beef/veal are faced with decreasing consumption trend and trade pressure from major competitors, adding to environmental and climate change challenges. There is a high export potential in the sector, notably to China, the second largest importer of beef in the world, and South East Asia. For these reasons, the EU intends to help producers and exporters in developing and exploring new markets via dedicated campaigns. Similarly, producers of table olives are currently faced with a difficult situation due to increased duties and it is opportune for them to diversify their exports and find new markets. These topics cover beef and veal as defined in Part XV and the table olives as defined in Part VII point b of Annex I of the Regulation (EU) No 1308/2013. 3.3.6 Why has the topic "Programmes to increase the consumption of fruit and vegetables in the internal market in the frame of proper dietary practices" been chosen? The fruit and vegetables sector faces persisting and new challenges such as: declining consumption and exports volume, repeated market crises (e.g. Russian embargoes, export difficulties in North African countries), market access difficulties mostly due to tariff and non-tariff barriers as well as a structurally weak bargaining position vis-à-vis large-scale retail and processing trade. The Commission is also committed to promote proper dietary practices, in line with the European Commission's white paper on a strategy on nutrition, overweight, and obesity related health issues. Programmes shall highlight the benefits of consuming fresh fruit and vegetables in a balanced diet. The messages could notably focus on: aiming at having at least 5 portions of a variety of fruit and vegetables each day; the place of fruit and vegetables in the food pyramid, beneficial impact on health, etc. For multi programmes, fruit and vegetables' proposals are also eligible under Topic A and D. For fruit and vegetables' programmes proposed under Topic A, the message shall be different than highlighting the benefits of consuming fruit and vegetables within a balanced and proper diet (except if fruit and vegetables are associated with (an)other product(s)). This topic covers all the types of fresh fruit and vegetables listed in Part IX of Annex I to the Regulation (EU) No 1308/2013. 3.3.7 Why has "Information and promotion programmes aiming to highlighting the sustainable aspect of rice production" been chosen as Topic C? Rice production in Europe has a particular environmental dimension, being at the heart of the preservation of certain wetlands. Rice cultivation is a sensitive and specific practice at European level, since it is produced in areas where there are few crop alternatives. Its preservation and improvement contribute to the sustainability of rice producing regions, by playing an active role in maintaining rural areas, protecting nature and preserving biodiversity. Therefore, it has a relevant impact in terms of economic, environmental and social sustainability all across the EU. The objective of this topic is to highlight the sustainable aspect of the rice sector and eligible products are those listed in Part II of Annex I of the Regulation (EU) No 1308/2013. 3.4.1 What if a programme wishes to target several of the prioritised geographical areas? There shall be one application per topic. In case a proposing organisation wishes to target several of the prioritised regions in third countries in one programme, it should therefore submit several applications (one application per topic). Alternatively, it could also apply under the topic ‘information and promotion programmes targeting other geographical areas’. This topic relates to the geographical areas that have not been listed in other topics, but it may also concern a combination of several prioritised regions listed in other topics. 3.4.2 What is meant by internal market? Is Norway or Switzerland considered as part of the internal market? Internal market means the 28 Member States of the EU. EFTA countries (Iceland, Liechtenstein, Norway and Switzerland) are not part of the internal market. 3.4.3 My programme will target 3 prioritised geographical areas, and I will submit 3 applications. How should I display the common costs? The programme proposals are to include the estimate of the costs of the activities. If the proposal is accepted, the contract determines 'the maximum grant amount' which cannot be (later) exceeded or increased even if the eligible costs of the programme are higher than planned. In addition, please note that the beneficiary can only claim the reimbursement of costs which were actually incurred by it during the implementation of the programme, bearing in mind that Article 10 of Regulation No1144/2014 prohibits double funding. In practice, if an applicant submits more than one programme proposal that contains 'common costs' it would be appropriate that each proposal includes the 'common costs' in full, together with the information about duplication of costs within several proposals. In case all proposals were accepted, the proposing organisation would then claim the common costs only once. 3.6.1 Is there flexibility between the amounts per topic? There is a large budgetary flexibility within each type of programmes - simple and multi. If for a given topic there are not enough proposals on the ranked list to consume the whole indicative amount, the remaining amount may be reallocated to other topics according to criteria announced in the work programme. 3.6.2 What are the criteria for reallocation of amounts which have not been used within the simple programmes? (c) if the foreseen amount is still not exhausted, the remaining amounts for both internal market and third countries shall be merged and assigned to projects with the highest quality score, irrespective of the priority and topic for which they have applied. The order of the ranked lists will be strictly followed. 3.6.3 What are the criteria for reallocation of amounts which have not been used within the multi programmes? If for a given topic there are not enough proposals on the ranked list to exhaust the whole foreseen amount, the remaining amount may be reallocated to other topics according to the following criterion: The total of the remaining foreseen amount for all five topics shall be merged and assigned to projects with the highest quality score, irrespective of the topic for which they have applied. 3.7.1 What happens in case of an unexpected crisis in 2019? In case of an unexpected serious market disturbance, loss of consumer confidence or other specific problems, the Commission could launch, under certain conditions, (an) additional call(s) for proposals dedicated to the selection of promotion programmes to react to a potential serious disturbance. 3.7.2 What was the outcome of the previous calls for proposals?